Every day, U.S. schools throw away $5 million worth of food. There are a lot of reasons for this shocking display of food waste, and schools are starting to come around on figuring out how to address it. In Oakland, an innovative program is fighting food waste and hunger at the same time, as Jonathan Bloom reports for Grist. Students in schools there are working with cafeteria workers to separate unwanted — but still edible — food from true compostables. You’ve probably heard about efforts to provide students with more nutritious meals, including lots of fresh produce options — a far cry from tater tots and corn dogs. On the surface, these initiatives are good, but on the ground, things can be a bit more challenging. 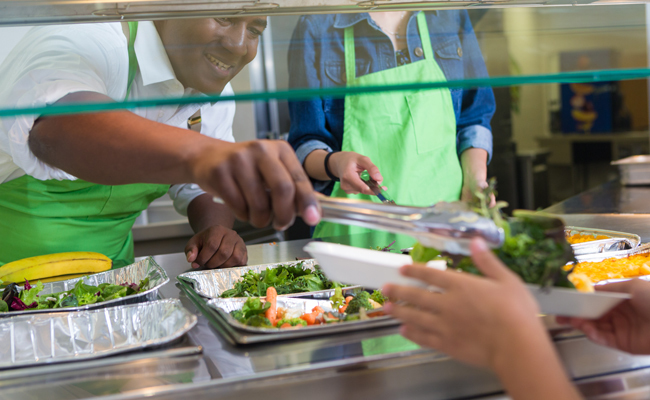 Depending on the cafeteria and the district, a school may be more or less equipped to meet these guidelines and help students navigate the changing cafeteria offerings. In some districts, students take on fresh fruit and vegetables with relish — sometimes even helping grow and harvest them. In others, kids don’t really know what to do with them, but the school is required to set them out anyway – or to have students pick up “choices” they know they don’t actually want. That’s where the problem lies: If cafeteria personnel put a piece of food on every tray, they can’t force students to eat that food. And when those students leave, they dump the unwanted food in the trash or compost. Unless, that is, they’re Oakland students — in which case they put it on a food share table. The cafeteria collects food that’s perfectly safe to eat — like plums people haven’t even bitten into — and reuses it later or donates it to an organization that can make sure it gets into hungry hands. “Take and go” is another option, allowing students to take something to eat later. Fighting food waste has a number of advantages; first of all, it can cut down on fiscal waste. Making food for 30 million kids a day is no easy feat. Parents feeding one kid have a tough enough time satisfying picky eaters. But it costs a lot of money — and with inefficiencies built in, that cost can become a serious problem. Addressing waste in a program this big can have an outsized impact that sets standards for other institutional settings like hospitals and companies that maintain their own cafeterias. It’s also a sound environmental choice. A third of the food we grow gets wasted. It spoils in the fields, rots in handling and transport or winds up in the compost at home after we forget about it in the back of the fridge or run out of time to cook it. Growing and transporting food takes up considerable natural resources, though, and it’s pretty grim to think about sinking all that energy and labor into such an inefficient process. Tackling industrial food waste like this is the fastest way to get these numbers down to a more manageable level. And by doing so in schools, we’re setting an example for kids, too. Oakland students are learning to separate true compost or trash from edible items they don’t want, and they’re thinking proactively about how to reduce waste and contribute to their communities. Instilling these kinds of values in the next generation is the best possible way to combat our shocking food waste statistics. Hopefully when these kids grow up, it will be in a world with much better controls on the supply chain and much more conscientious consumers. If you’re troubled by food waste and you have kids, ask their school what they’re doing about this issue. If they don’t have a waste reduction plan, consider bringing the issue to the school board or another governance agency to push for one. Sometimes all it takes is a few dedicated parents to change the landscape, introducing a concept a school hadn’t considered before but might be interested in implementing. anything left over can and should be used!!! !